An ergonomic workplace with the proper equipment is essential for healthy, sustainable office activity. On this page you will find the most important aspects with specific product recommendations. To prevent eyestrain, the contrast between the monitor and the surrounding area should be as small as possible. If your workplace is not optimally illuminated, you should lower the brightness of your monitor. The optimum viewing distance to the monitor is about an arm's length. If you sit too far away, it may happen that you let your head slip forward. The screen should be placed right in front of you so that you don't have to turn your head or upper body. The top edge of your monitor should be placed a few centimeters below eye level, so you can look down slightly while working. If you work on a laptop you can use the corresponding docking station (if available), a universal laptop stand (price: ) or you could increase the height with some magazines. The standard height of a desk suits normal activities, however it is a bit too high when working with a keyboard. The best option is a height-adjustable desk that you can adjust according to your height and current activity (price: ). From time to time you can use it as a standing desk as well, so that you don't have to sit all day. 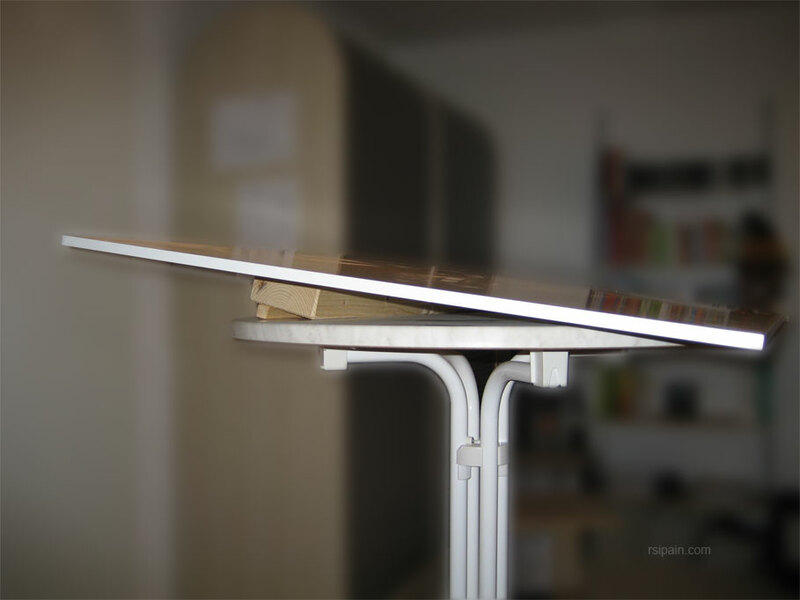 An alternative is a regular desk with a lower-lying keyboard tray (see image, right person) (price: ). When using the keyboard, elbow, hip and knee should have an angle of about 100 °. If you work on a standard desk and are not exceptionally large, either your feet dangle in the air or your elbow angle is less than 100 ° (which would be restricting blood flow). You can get by with a foot rest (see image, left person) (price: ). You should arrange your workplace in a way that your desk stands parallel to the window. That way you avoid a high contrast between the monitor and the bright background outside and you don't have sun reflections on the screen. Working at a regular desk all day can cause stress on your back. A better option would be a height-adjustable desk (see above) which is relatively expensive though. A cheaper alternative is a bar table (price: ), combined with a large wooden plate from the DIY market and a block of wood for tilting the working surface (with a glued rubber lip, so that the wooden plate does not slip out of position). Such a standing desk can be easily used for all private desk work at home. A good office chair is height-adjustable, has proper lumbar support, a tiltable backrest and seating surface and the backrest angle can be fixed or remain variable. The variable setting supports "active sitting", which means that you are constantly moving your body. A professional chair lets you adjust the pressure of the backrest to the individual weight of the user. Armrests are recommended, but only if they are height-adjustable and relatively short (so that you can work closely to your desk) and can be adjusted to your shoulder width. An office chair should be tested and bought in a specialty store. There you also get expert advice on the correct settings. A balance disc (price: ) is an air-filled disc, which can be placed onto any chair. It serves the same purpose as a sitting ball, it stimulates a moving body, thus preventing tension in the back, shoulder and neck area. At the same time, it doesn't have the disadvantages of a sitting ball (no back support, risk of accident) and is portable at the same time. I recommend alternating between using the office chair with and without a balance disc. Newspapers, magazines, books, documents, etc. usually lie on a desk while reading. You have to tilt your head forward which strains your neck muscles. Give them a rest with the help of a book stand (price: ). A split key field to avoid bending your wrists to the outside (your tendons would irritate their tendon sheaths). A palm rest to avoid bending your wrists to the upside (your tendons would irritate their tendon sheaths). Even better would be a keyboard with a negative tilt (backwards). A curved key field (higher in the central section) to reduce the twisting of your forearms (you relieve your muscles and support the blood flow). Microsoft Natural Ergonomic Keyboard 4000: The Natural Ergonomic Keyboard 4000 prevents bending of the wrists and reduces the twisting of the forearms. I have been using this as my main keyboard for a couple of years now with great satisfaction. It is a bit too wide for right-handers however. Due to the number pad your right mouse arm is located a bit too far away from your body. That's one of the reasons why I switched to using the mouse with my left hand. There is an optional front riser to achieve a negative tilt (and I gladly use it). Overall the keyboard is a bit too high. That could have been engineered better. Despite everything it still is my favorite keyboard (price: ). If the purchase of a new keyboard is not possible, you should use an additional wrist rest (price: ) with your existing keyboard. That at least avoids bending your wrists to the upside. If you suffer from shoulder and neck pain rather than from forearm pain, then a fourth aspect is important: the width of the keyboard. The number pad broadens the keyboard and the mouse use puts strain on your right shoulder/back area. With a conventional mouse your forearm lies flat on the table and the wrist is bent upwards (see image below, top right). With each mouse click the tendon of your index finger irritates its tendon sheath. Instead, the wrist should be as straight as possible. You can either use a wrist rest (price: ) or a special mouse. The wrist rest has the disadvantages that it promotes wrist movements (rather than larger arm movements) which might aggravate existing wrist pain and it could negatively affect blood flow. Thus I prefer ergonomic mice which also allow straight wrists and reduce forearm twisting (ulna and radius are almost parallel, see left image). You will need about two weeks to be able to work as effective as before. Depending on the type and location of your pain, different mice may be useful. The selection of your favorite mouse is a very individual decision. Even people with similar pain often assess the same model very differently. 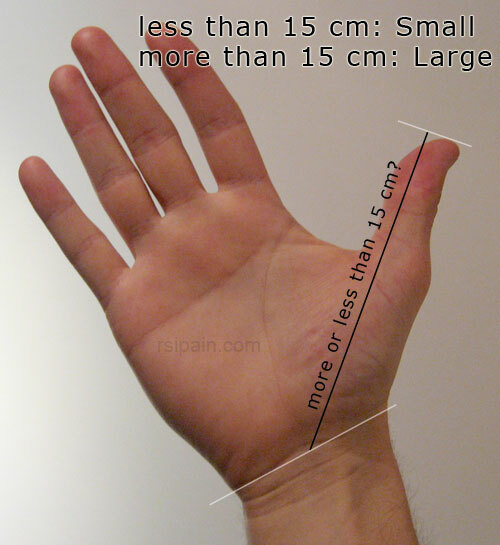 If you primarily feel pain in the wrist and forearm and little to none in the neck/shoulder area, your hand should be able to rest on the mouse while using it. The movements should come out of the entire arm. Hippus HandShoe Mouse: This mouse appears to be of excellent quality, it fits your hand comfortably and requires only a short adjustment period. It is offered in three different sizes (measure the distance from your wrist up to the tip of the ring finger: < 17cm [small] | 17-19cm [medium] | > 19cm [large]). Each size is available as a wired and wireless version. I particularly recommended this mouse for the prevention and if you only have minor pain. E-Quill AirO2bic: I have been using the E-Quill-mouse for years and I really like it. The movements come out of the entire arm, even more so compared to the Hippus mouse. It is made of very cheap looking plastic, which does not match the price level. Nevertheless, I never had any problem with it and it still works as on day one. The slope of the hand support is very steep, but it fits my idea of a neutral forearm posture. If you primarily feel pain in the shoulder area, then a small keyboard is important so that you can use the mouse closely to your body. Secondly, you should use a (standard) mouse, where you bend the wrist (=your forearm rests on the table). Alternatively, you could also use a roller bar mouse directly in front of the keyboard or you could try a graphics tablet. Mousetrapper Advance: The Mousetrapper works similarly to a laptop touchpad. It is placed in front of the keyboard, so that you don't have to reach out with your mouse arm. The adjustment period is short (because of the similarity to laptop touchpad). Rollermouse: The Rollermouse is very similar to the Mousetrapper. But instead of a touchpad you operate the cursor by moving a rotatable bar with your fingers. I like it as well and also the adjustment period is surprisingly short. Wacom Intuos: For people who often work with image editing programs, a graphics tablet is the perfect option. With the precision of accustomed finger/hand movements, you can be more productive than with a regular mouse. But even with regular PC work, I see advantages over a standard mouse. However, if you still write a lot with pen and paper, then you might opt for the Mousetrapper or Rollermouse instead, in order to have a bit more variety during the day. The Wacom Intuos Pen and Touch can be operated with finger movements or with the corresponding pen. It is available in different sizes. If the pain is located in your index or middle finger, then a mouse with a thumb button might be the best option. In addition to that, you should use an auto click program. However, even using an ergonomic mouse if you have a stiff body posture this is unhealthy if done several hours a day. As long as you do not have to move the mouse or press a mouse button, put your hands in your lap and relax. It is also important that you get up every now and then and shake out your arms. The use of two simultaneously connected mice (left and right) can spread the strain on both hands thus reducing the risk of injury. If you already are in chronic pain, use different hand postures and mouse surfaces to erase the pain memory. All recommended ergonomic mice appear to be expensive, at least compared to standard $5 models. But if an ergonomic mouse can prevent just one sick day due to pain, it has already paid for itself (financially for the employer and health wise for the employee). Since RSI doesn't usually subside after only one day (a sick leave for several weeks or even months is not uncommon), much money can be saved in the long run. When writing texts on the PC voice recognition software is by far the greatest relief available. In my opinion, it brings a much greater relief than the best ergonomic keyboard could ever achieve. You speak into a microphone and the software writes down everything you say. In the past the recognition quality was not good. Nnowadays you can already work productively after a very short training period. Supported programs Basic dictation works with any program. In addition, some programs are supported with special voice commands (Internet Explorer, Firefox, Chrome, Microsoft Office et al. | details). Most Microsoft programs are supported, many others unfortunately not. If you have a Mac you can use the integrated speech recognition: Apple > System Preferences > Keyboard > Dictation (more information). For the first couple of months I worked with the built-in Windows speech recognition. Then I switched to Dragon, mainly because of the better support of non-Microsoft programs. Writing longer texts with Dragon is considerably more relaxed than typing on a keyboard, so I also recommend this software to people without wrist pain. People who aren't fast at typing also benefit from not having to worry about where the letters are located on the keyboard. If you do not have an external microphone, I recommend a cheap, but perfectly adequate headset (Price: ). An internal laptop microphone is not sufficient and will produce bad results. I use many of the products presented here every day and they make my life so much better. 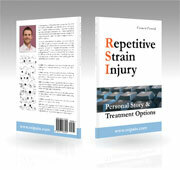 But they don't just help RSI sufferers, they also help to prevent injuring yourself in the first place.